Our Products >> .50-70 Govt., New Production, Lead, One Cartridge, No Returns. Limted to 2 cartrridges per collector. One Cartridge not a Box! : .50-70 Government, new production using Starline Brass with “*ˆ*50-70 GOVT.” Head-Stamp and loaded with a 450 grain Lead Projectile. 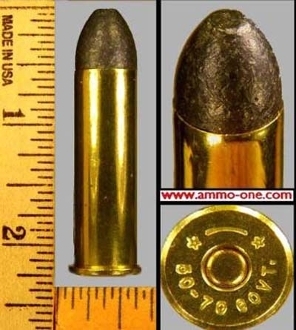 These cartridges may not work well in older firearms, due to the firearms worn barrels. no returns, sold as a collectible. .50-70 Govt., New Production, Lead, One Cartridge, No Returns.